What is it about music boxes that is so captivating? Do any of you out there share this predilection of mine? This morning my daughter, who just turned ten, dug from the avalanche of her closet a music box my wife and I gave her five years ago. She wound it up and sat staring raptly into it and listening to the melody. “This makes me think about when I was little,” she said. Funny, a ten-year-old experiencing nostalgia. But it’s true, there’s something ineffably nostalgic about music boxes. Part of it is the time-capsule element of bygone craftsmanship. But there’s more than that. Music boxes form a small but recurring theme in my life. We had two of them in our house, passed down from my mother’s Ohio-German side of the family. As a boy I would go into the small room, outside the downstairs bathroom, where they were kept, and wind up one or the other. I’d sit there mesmerized, watching the tuned teeth of the comb being plucked by pins on the revolving cylinder. I was entranced by the particular quality of the music, those hollow, quaint, harp-like notes. Even the silences, filled with the faint rasp of gears, fascinated. Our two music boxes couldn’t have been more dissimilar. One was made to resemble a mini pirate treasure chest, with bronze hasps and a red velvet interior. The other was a sleek Art Deco-style burnished oak box, rectangular, with rounded edges. It played a couple of Strauss waltzes, “Tales from the Vienna Woods” and “Blue Danube,” along with Brahm’s Lullaby, and one other melody I can’t recall. These music boxes evoked my long-dead grandparents and their world of German immigrants in rural Ohio, a world I had never seen, but encountered via my mother’s oft-told tales of great farm feasts and bizarre foods (like pickled tongue); ancient, daguerrotype-like photos of dour men in long beards; my mother’s habit of saying Danke schöen! and Bitte schöen! ; and other vestiges of immigrant farm life. Somehow all that was contained in two little boxes, along with the lullabies and waltzes. For a suburban Connecticut boy in the 1960s, it triggered a strange nostalgia for a life and time that wasn’t even my own. The modern music box was perfected by Swiss watchmakers, and by the end of the 19th century had spread to the United States. In 1892 Gustave Brachhausen opened the Regina Music Box Company in Rahway, NJ, and sold more than 100,000 of them before closing in 1921. (Check out these company photos from a century ago.) Further back, the device has its roots in the Enlightenment’s golden age of automata. Precursors to robots, these ingenious machines were designed to follow set sequences of actions automatically, giving the illusion of operating under their own power. Both anticipating and reflecting the Industrial Revolution’s elevation of the machine, automata were popular courtly diversions; as a child, Louis XIV was captivated by a miniature coach and horses, complete with footmen, page and a lady within, that circled on a metal plate. Eighteenth-century automatons included a Swiss-made device (now on display at Philadelphia’s Franklin Institute Science Museum) capable of drawing pictures and writing poems. In 1769, a chess-playing machine called The Turk astonished Europe (operated from within by a hidden human, it was not a true automaton), later fascinating writers from Ambrose Bierce to Walter Benjamin. That fascination arose from the way automata seemed to blur the boundary between the biological and the mechanical – like the 1739 Digesting Duck in France, a mechanical mallard that gave the illusion of eating and defecating. Music boxes effect a similar blurring. When I asked my daughter what she likes about them, she answered, “How simply complex they are,” then elaborated: “The song is very simple, but you can look inside and see how it takes every little piece to make it go perfectly.” The music box presents the mechanical as fluid; its exposed machinery allows you to see how a song is made, and thus joins manufacturing and music, industry and art. The Art Deco box of my youth, I recall now, had an offset mechanism that allowed four songs to be packed onto the same cylinder: after each song the cylinder would shift a tiny bit laterally, so that the comb teeth would be activated by a different set of pins on the cylinder. In effect, it contained four different codes simultaneously, side by side. How ingenious, and how perfectly designed. Poetry by engineering. Those two music boxes disappeared long ago, in the tumult of my parents’ divorce and our family’s dispersal. Many years later, after my mother’s death, the Art Deco one surfaced in a chest in my damp basement – broken, corroded, and unplayable. I threw it out. Now, though, by the magic of the internet, I have discovered its provenance. 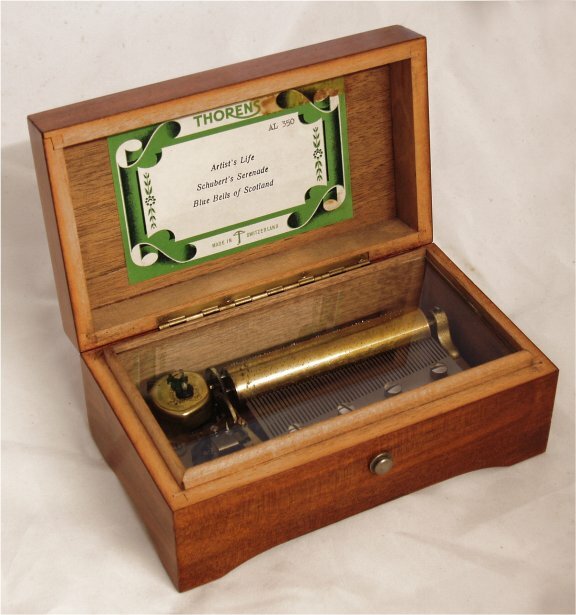 Our music box was made by Thorens, a Swiss company founded in 1883, and looked exactly like this one, with the melody titles typed on the scroll-themed, green-and-white garlanded sticker affixed to the underside of the top. Here is a nicely made Youtube closeup video of the action of a box like the one we had. It shows the process beautifully – note how the cylinder clicks and shifts laterally, in offset mode, at 2:20 minutes in, just before the Blue Danube waltz begins. For all their ability to enchant, music boxes can also strike more discordant life notes. Their capacity for dark secrecy informed the eponymous 1989 Costa Gavras film, starring Jessica Lange as the daughter of a Hungarian WWII collaborator; at the film’s climax she discovers, in damning photos hidden away in the bottom of a music box, the awful truth of her father’s wartime role. In my case, I wince to recall the box my father bought my mother as a birthday present, right around the time their marriage was falling apart. Gaudily ornamented, decorated on the top with a lacquered reproduction of some Renaissance painting, it was “fancy” in a bad way, and pretty much exactly the opposite of my mother’s taste -- the kind of badly misjudged gift that shows you are not actually thinking about the recipient, but someone else. Beyond all that, there’s a melancholy undertone to the very enchantment that is the music box’s chief draw. It’s interesting that nostalgia was long thought of as an illness. The term was coined, suitably enough, by a Swiss physician whose 1688 dissertation cobbled together two Greek words to fashion a neologism for “the pain of homecoming.” It makes sense that the country that invented the modern music box also invented the concept of nostalgia. The Swiss were considered especially prone to homesickness, so much so that it became known as “the Swiss disease.” It was said to be triggered especially by music; during the Thirty Years War, Swiss mercenaries were considered so susceptible to it that the playing of a particular Swiss milking song was punishable by death (you can listen to it here.) Nostalgia as disease described a clinical wistfulness at the prospect of a lost home in the world -- the forsaken Heimat -- and an encompassing, consuming, impossible desire to get back. For me it was surprising to learn, via the Internet find, that the box I grew up listening to was not an artifact from those Ohio farms of long ago, but likely dates to around 1950 or a little earlier. My grandparents were already very old by then, and I wonder what exactly they thought about when they listened to it. In my case the Swiss disease entails a double nostalgia: first, for the distant echo of my ancestors’ past, and then again for the Heimat of my own childhood family, lost to divorce, dispersal, and death. In time I came to understand the melancholy lure of nostalgia and my susceptibility to it, and to be on guard. But I still can’t hear Tales from the Vienna Woods, plucked and amplified in a little mechanical dream box, without getting choked up.